Our US road trip plan was extremely packed. In fact, it turned out that we will spend only two days in San Francisco, on the first day we wanted to fully dedicate ourselves to worshipping temples of shopping, so the second day would be more touristy. Visiting most famous San Francisco attractions in one day is of course possible. 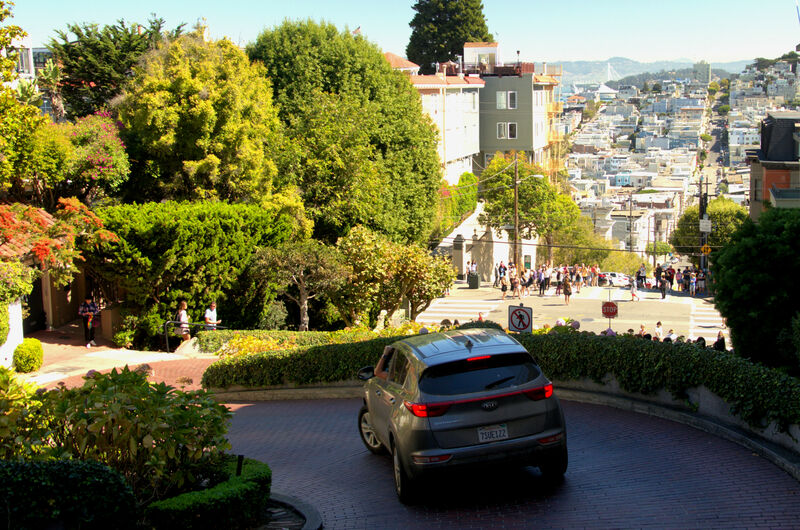 However, to see the best of San Francisco in 24 hours, you still need a good plan, but don’t worry – we would like to share it with you. So, how to see San Francisco in one day? Tip: Find out more how our West Coast road trip itinerary looked like and how to rent a car in the US! Accommodation in San Francisco can be a total rip off. However, we still recommend you staying in the city or on the outskirts. It’s definitely the best option if you want to see the best of San Francisco in 24 hours. If you plan to stay somewhere more distant, the morning traffic will make you get to the downtown most likely at noon or even later. We stayed in a nice motel Americas Best Value Inn & Suites near the airport, the price was pretty decent, around $ 180 (when it comes to San Francisco, of course, in Germany you would stay at fab 5 * hotel with spa overlooking the Alps). In the city center there are plenty of cozy hostels, but as we started booking our accommodation one week before departure, we had a very limited choice. Click here to book your perfect hotel in San Francisco! TIP: If you decide on staying in a hostel in the strict city center, then you must be aware that many of areas may be pretty dangerous. It is better to avoid them after sunset. Tenderloin area, Ellis Street, 6th Street between Market and Mission Street… Just Google them. If you think “all the bad boyz in my town are my homies,” you may be surprised. It is very likely that you have never come across anything like this before: dozens of prostitutes standing in the streets, dealers openly offering drugs, hundreds of irrationally behaving junkies and people sleeping on the sidewalk. WHY ARE SOME AREAS SO DANGEROUS? One of the reasons for this is the fact that in the 70’s psychiatric hospitals let go many patients freely. They actually had no place to go so they stayed on the streets. A trip to these areas may result in broken car windows, quiet escape from the man chasing you with a syringe in his hand and other attractions for the risk-lovers. Of course, you may also experience this in the other parts of San Francisco (as in every big city), but certainly not with such intensity. I still remember a couple standing behind us in the queue to the restaurant (at noon), which was already exploring different states of consciousness, in addition, smoking weed openly. Everything would be ok, but the girl had such a good trip that all in all it was necessary to revive her. Just another lovely day in San Fran. First of all, you have to be patient. As this is a cult place, you will have to wait about 30 minutes in line. You have to also take some cash or US debit card with you because they do not accept credit cards. Is the food worth all this struggle? YES. DEFINITELY. This restaurant may be one of the San Francisco attractions itself! Food is really delicious, all dishes are prepared basing on home recipes for over 50 years. 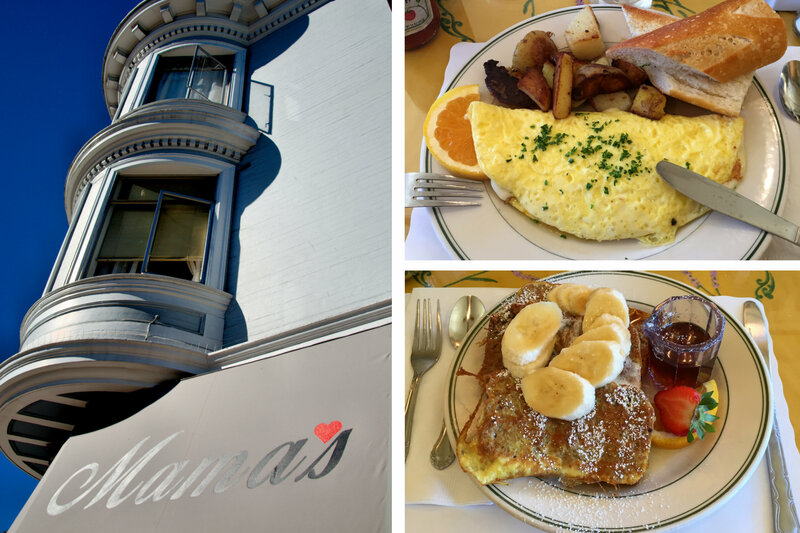 You can choose from fluffy omelets, sweet French toasts, layered pancakes… I fell in love with Banana Bread French toasts! Om nom nom! Reasonable prices (of course I have to add – as per San Francisco standards), cozy decor, aromatic coffee and you are ready to go in a perfect mood. We decided to go sightseeing by car. It’s definitely the best option if you want to see the best of San Francisco in 24 hours.The city center itself is not too packed with cars and parking fees are reasonable. Surprisingly, there is no problem finding a parking spot (what a difference to Munich!). The world-famous steep winding street – in 400 meters there are 8 turns! Looking at the number of tourists there, you can only feel sorry for residents living in the middle of chaos. There were even plans of closing the street only for people living there. On the other hand, this hustle and bustle is definitely compensated by stunning surroundings. 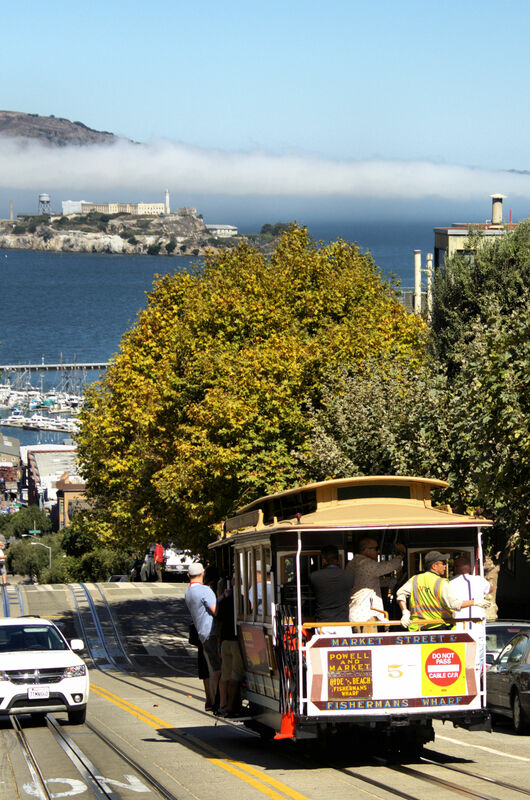 From the top of the street, you have a perfect view of Alcatraz and characteristic Cable Cars passing by. We would not be ourselves if we didn’t drive down this street, obviously we are not the only ones which had this idea – at the top of the street there is a queue of cars waiting politely, then gooo! (ok, maybe not that fast, our good old Dodge Charger barely was fitting in all these corners :-). While arriving at the bottom you have to watch out not to kill a Chinese tourist who doesn’t give a damn and stands in the middle of the road to take a better picture. 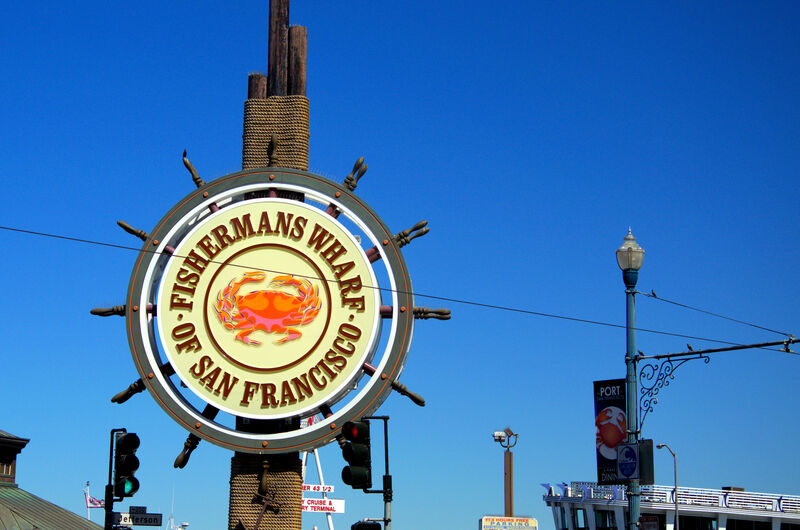 We made our next stop in Fisherman’s Wharf and Pier 39. This is the third most popular attraction in the USA! What you can find here… Shops and restaurants with fresh seafood, kiosks with unique gifts made in China. Aquarium, where you can see marine animals rescued from the Bay region. There is also the USS Pampanito submarine and World War II ship – SS Jeremiah O’Brien… But above all, hey, there are sea lions, lazily relaxing in the middle of the marina. They are really most charming animals ever. Although the whole area looks like a fair, it’s definitely worth visiting for this element of “wildlife in the big city”! There are 3 lines to choose from, and one ride costs $ 7. You must be aware that every day probably one million tourists has this brilliant idea of taking a ride. 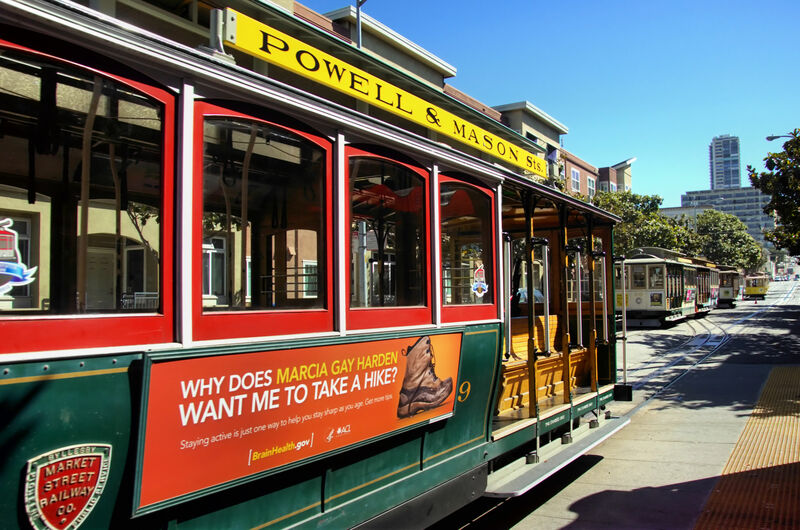 But I’ll tell you a little secret – decide to ride the Powell-Mason line, which takes you to Union Square. 99% of tourists come to the Powell-Hyde line and wait in a really long queue. Ok, maybe the route is more spectacular – starts next to the Bay and passes next to Lombard Street, overlooking Alcatraz. To be honest, after waiting in line for several hours I would just have enough. 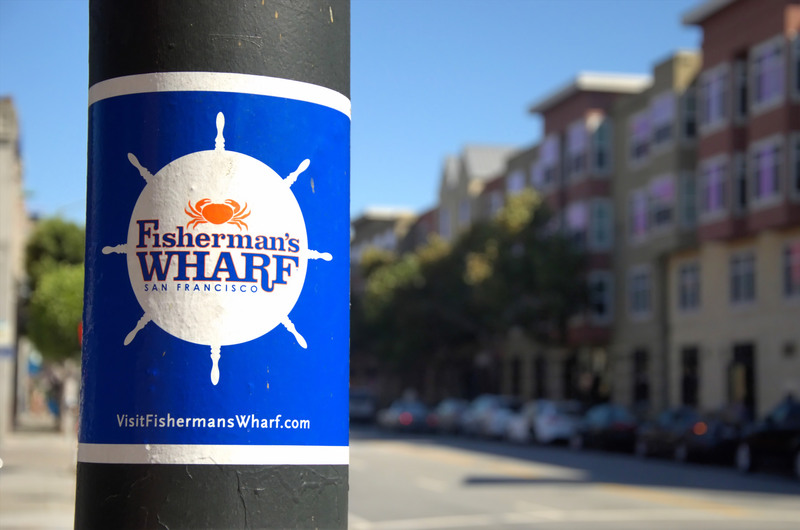 The same things you can see driving the car and the view of Alcatraz is even much better from Fisherman’s Wharf. The most famous prison in the world, which supposedly no one could escape. How does this relate to information that the prison has been closed i.e. due to construction errors which made escaping possible? At this point, let me quote Wikipedia: Officially, for 29 years of prison existence, any prisoner could not escape it, although there were reported 14 attempts involving 34 prisoners, including two who tried to escape twice; six fugitives were shot, two drowned, five were not found, the others were captured. Well, everything is clear now – escape attempts were possible, no matter that they failed. The desperation of prisoners had to be really huge – although the island is only about a mile from the mainland, the water temperature can be only 8°C degrees! If you want to see how jail cells and toilets cleaned by infamous Al Capone look like, you have to plan your visit in really big advance. This is one of the most popular San Francisco attractions. Tickets sell out so quickly, a month – two months before the planned visit there is nothing left. We didn’t have enough luck to get them. Take into account that every year almost million tourists visit Alcatraz! 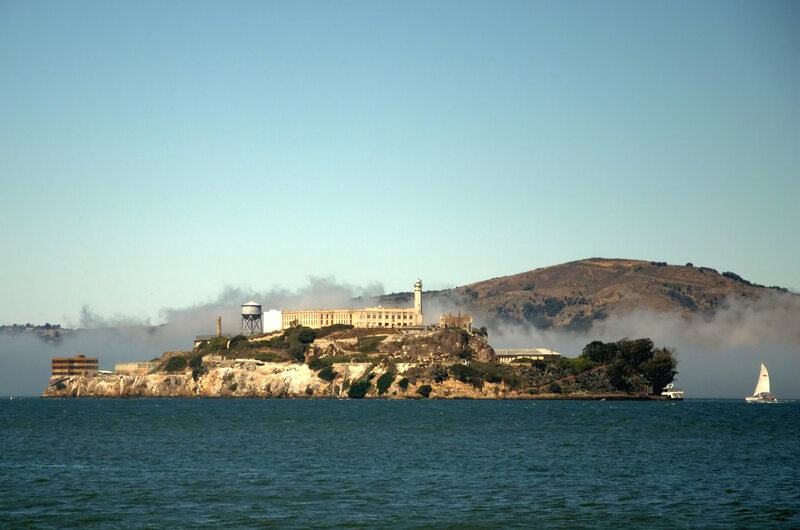 To cheer you up a bit – you can enjoy spectacular views of the prison from the waterfront. 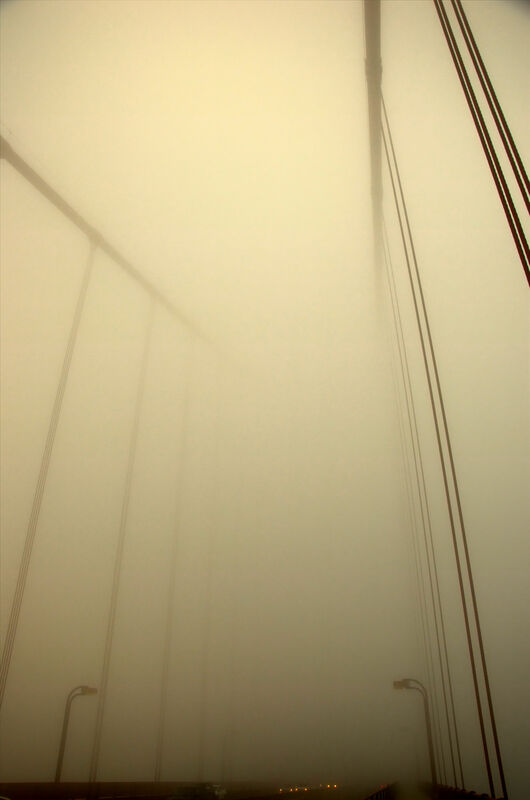 Time for the world’s most famous bridge and one of the most iconic San Francisco attractions.It’s definitely the most significant landmark during visiting best of San Francisco in 24 hours. Opened in 1937, survived many earthquakes. It was closed due to bad weather only 3 times – the wind was exceeding 100 km/h. to time you could hear the terrifying sound of sirens (as in the War of the Worlds, seriously) to protect ships from crashing the bridge. 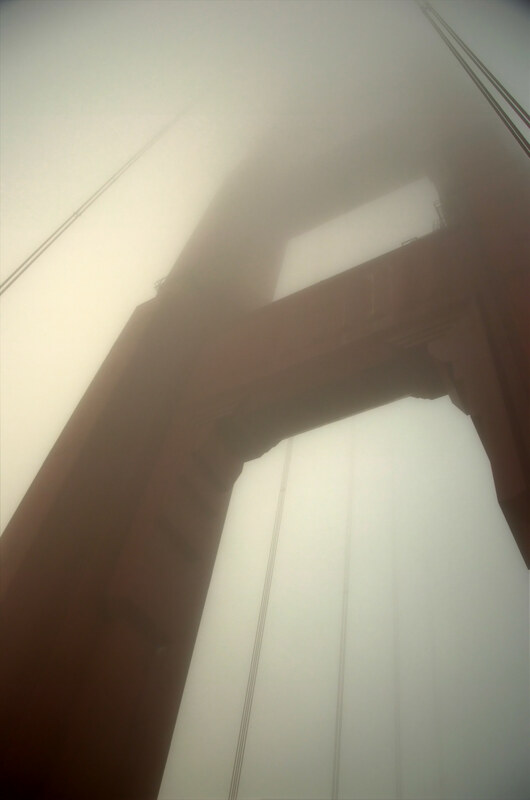 I had very depressing and gloomy impression of Golden Gate. I knew beforehand that more than 2,000 people decided to end their life by jumping from the bridge into the depths of the Bay. I wonder if all these signs of support and hope really work? Did anyone someone called a psychologist from the phone to the bridge? Very interesting action. 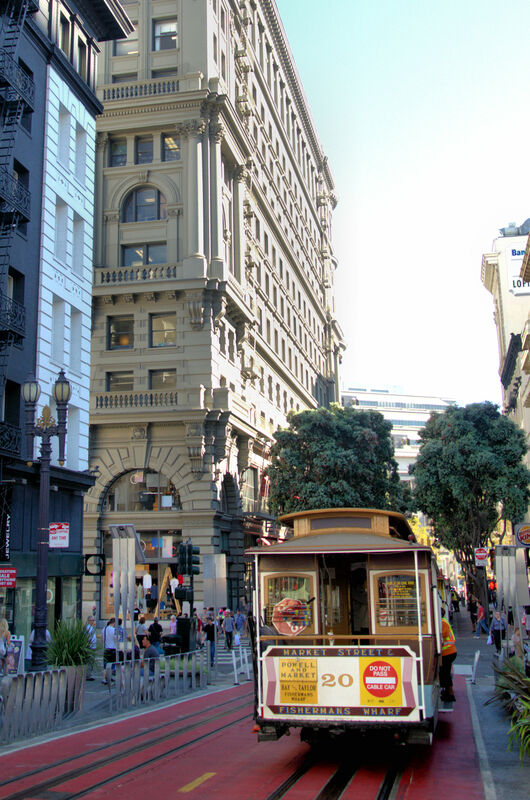 San Francisco attractions are incredibly interesting, extremely diverse as the city itself. I know we only saw the best of San Francisco in 24 hours, not anything less-touristy, but we still loved this city. On the one hand, you have Chinatown (visited by tourists more often than the Golden Gate! ), the largest Chinese community outside Asia, on the other – the city is so American. Another paradox is that you can meet the homeless and junkies on every corner, while a few miles further there are offices of the richest companies in the world – Facebook, Microsoft, and Apple. The beautiful peaceful scenery of the Gulf is in contradiction to skyscrapers. It is definitely worth visiting this city at least for one day! We are still very impressed by San Francisco. If you have few days left, we strongly recommend you visiting nearby wine region – Napa Valley. 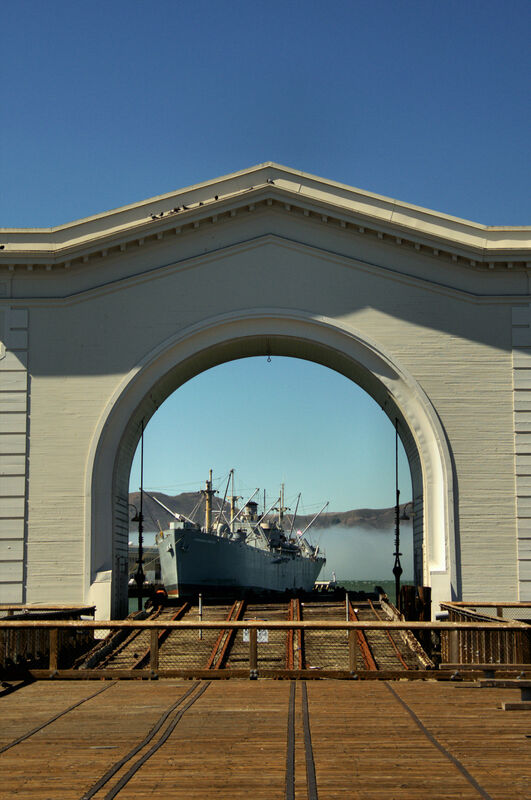 Do you recommend other San Francisco attractions? What are your tips to see the best of San Francisco in 24 hours? For more our adventures in the US, click here!